A day out in the countryside is never an ordinary outing if Mrs Pepperpot's involved. First, she has to be rescued from a mountain of ice cream by an abandoned kitten. Then she has to use her wits to outsmart a crafty fox and rescue a puppy from the circus. In fact she shrinks five times - and Mr Pepperpot hardly notices a thing! A compilation of four fantastic short stories including: "Mrs Pepperpot's Outing"; "Mrs Pepperpot Has a Visitor From America"; "Gapy Gob Gets a Letter From the King"; and, "Mrs Pepperpot and the Budgerigar". About Marianne Helweg (Adapter) : Marianne Helweg is a published adapter and a translator. 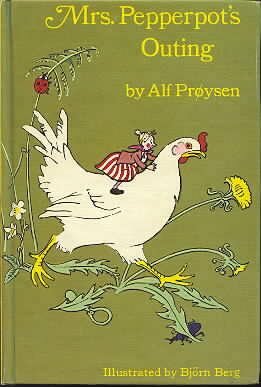 Published credits of Marianne Helweg include Mrs. Pepperpot Goes Berry Picking and Mrs Pepperpots Outing. About Bjorn Berg (Illustrator) : Bjorn Berg is a published illustrator of children's books. Published credits of Bjorn Berg include Mrs Pepperpots Outing, Emil's Pranks.